Following Germano Facetti's departure in 1972, David Pelham's role as fiction art director expanded to cover all the books that Penguin published. 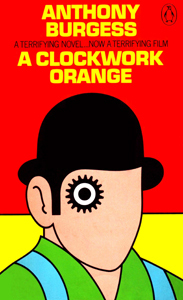 It was also the year that Penguin published A Clockwork Orange to coincide with the release of Stanley Kubrick's film adaptation, which the novel's author Anthony Burgess later described as 'clockwork marmalade'. The novel was not part of a Penguin sf series and Pelham had not been expecting to do the cover, but the designer he commissioned kept asking for more time and eventually submitted 'a very poor job very late'. Pelham had no option but to reject it, 'which was a hateful thing to have to do because we were now right out of time' and he had to come up with an alternative cover literally overnight. This he did, with a cog for an eye that brilliantly alludes to both clockwork and the protagonist Alex, who wears black mascara in Kubrick's film and has his eyes pinned open for Ludovico conditioning. Published by Penguin Books January 1972 with cover art by David Pelham. To Pelham's surprise his cog-eyed droog went on to acquire iconic status and is now regarded as one of the best book covers of all time. It is probably the longest serving cover of all time too, since it remained in use for over twenty-five years, except for a reprint in 1973 which retained the strap-line 'A TERRIFYING NOVEL ... NOW A TERRIFYING FILM' but used the artwork from Philip Castle's film poster. 1973 reprint with cover art by Philip Castle. Pelham's cover then returned and the strap-line was replaced with a short black rule. 1973 reprint with cover art by David Pelham. 1992 reprint with cover art by David Pelham. 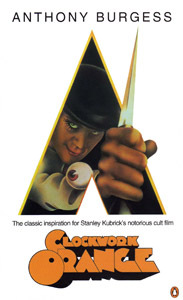 The cog-eyed droog was finally retired in 1996, although the UK release of Kubrick's film on DVD triggered a reprint four years later with Philip Castle's artwork forming the A of A Clockwork Orange, as it did on his original film poster. 2000 reprint with cover art by Philip Castle. 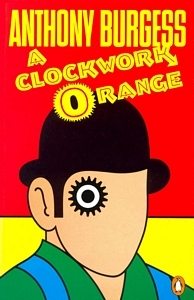 The title of Burgess' novel comes from an East London expression, he's as queer as a clockwork orange, meaning that appearances can be deceptive. 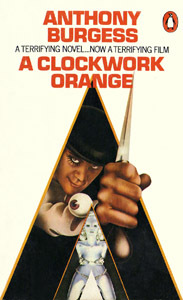 However, Burgess had also worked in Malaysia, where 'orang' means man, as in orang-utan, so A Clockwork Orange may also refer to a mechanical man – a man without free will, like Alex, whose Ludovico conditioning causes him to suffer incapacitating nausea if he contemplates, or even witnesses, a violent act.